Northern Italy’s spectacular South Tyrol is one of those European regions which has changed hands so many times that it’s a wonderful mash-up of cultures and has a national colour all its own. In the case of the South Tyrol it’s the whiff of strudel in the air, the medieval pointed churches and the wonderful wooden chalets - oh, and of course the prevalence of German as a language, which might make you think you’re in Austria. 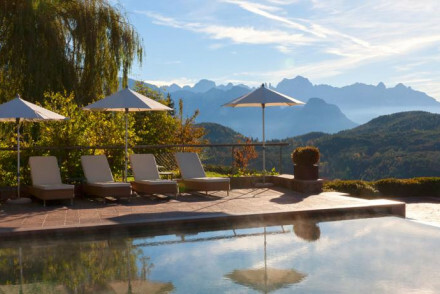 At the foot of the Dolomites and surrounded by some of Europe’s most spectacular alpine scenery, our Gurus definitely agree that the best places to stay in the South Tyrol are those with the most spectacular views. Bolzano is capital of the region and is a small city in a gorgeous location. Popular both in winter and summer it is particularly known for an excellent Christmas market which is the ideal event for kicking off your festivities. Castelrotto enjoys one of the most spectacular locatons with views over the Alpe de Siusi, Europe's largest alpine meadow. Come for the winter sports or hiking and biking during the summer. Merano offers not only alpine views, but tropical plants (you can find palms and cacti here), due to a sunny microclimate. There is some pretty beautiful architecture too from medieval old town to art-deco villas. 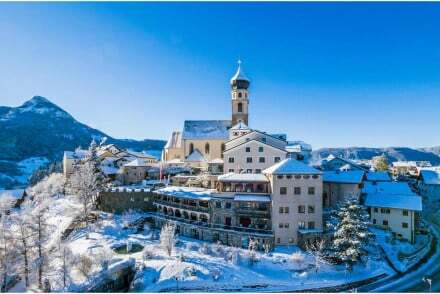 But don't forget that the best places to stay in the South Tyrol are busy year round destinations. So if you want to stay in peak season, do yourself a favour and book well ahead. 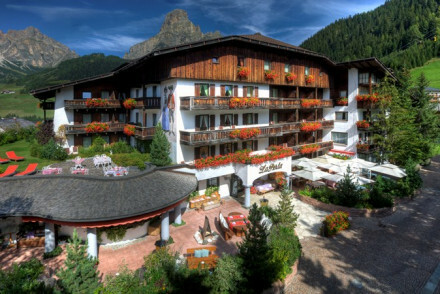 Alpina Dolomites is a five-star hotel in a breathtaking location with panoramic views of the Dolomites. The design is minimal and eco-friendly and fits well into the dramatic location. There’s a top of the range spa, pools and ski-in and out facilities. The Adler Mountain Lodge is a luxurious collection of contemporary suites and chalets in glass and wood, offering the least fuss and obstruction to the striking views. There’s also a spa and gourmet restaurant. 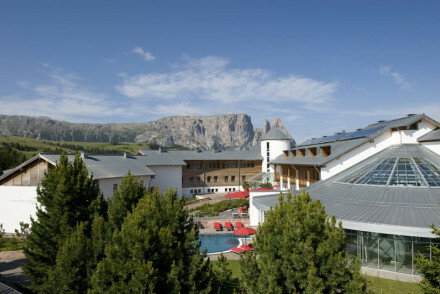 Seiser Alm Urthaler is a large, modern, sustainably built five-star lodge near Bolzano. 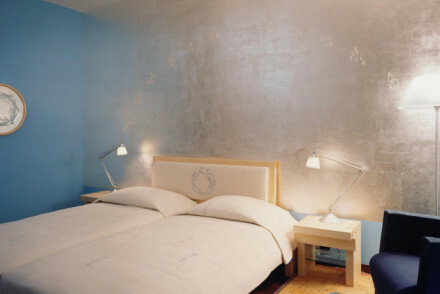 With 62 light-washed rooms and simple, contemporary style. There’s also a top of the range spa and a great restaurant. 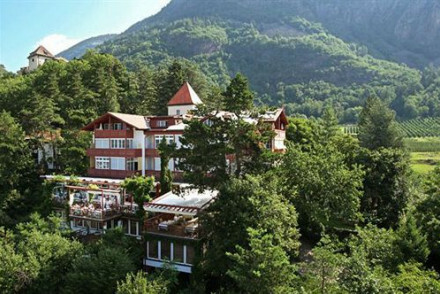 The Vigilius Mountain Resort is a wonderful eco-friendly alpine resort with Nordic-style decor and an extensive spa. There are 35 rooms and suites, all with plenty of natural light, plus there are some lovely terraces and a choice of two restaurants. Ciasa Salares offers incredible panoramic views of the Dolomites with 50 classic chalet-style rooms and suites and plenty of pine and four-poster beds. There’s also a spa and a gourmet restaurant. 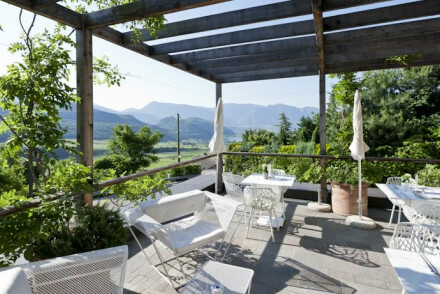 Gius La Residenza offers something a bit different from the astounding alpine views - astounding alpine views with vineyards! This nine room boutique hotel is a romantic option on the South Tyrollean Wine Road and is known for amazing food and wine. 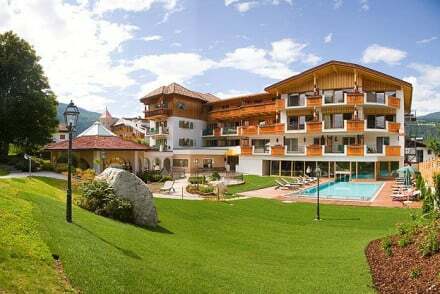 The Hotel Uhrenhof-Deur is a charming chalet with mountain views, classic alpine style and a range of accommodation options from rooms to family suites. 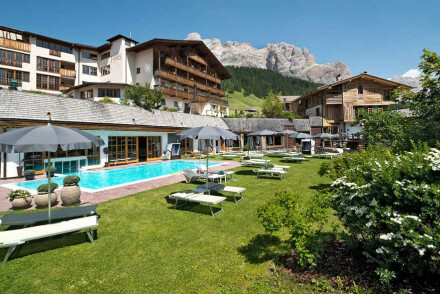 There’s an excellent restaurant and spa and has good access to the slopes of the Val Gardena and Dolomiti. 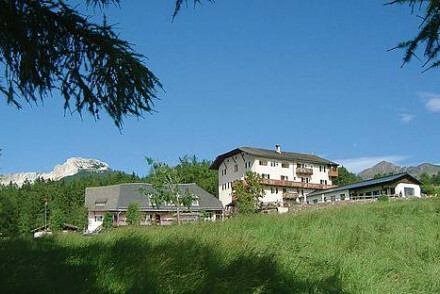 The Hotel Capella is an historic chalet with a long history as a ski resort. The rooms and suites are traditional and cosy with some nice features - some have four-poster beds and private balconies. The views, especially from the terrace restaurant, are spectacular. Plus there’s a top of the range spa. 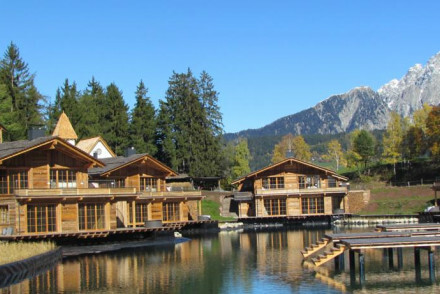 The Hotel Mayr is a luxurious, traditional wooden style, ski lodge with grand views of the Geisler mountain range and the Schlerm massif. There's a great spa and the well regarded restaurant serves Tyrollean and Italian specialities. 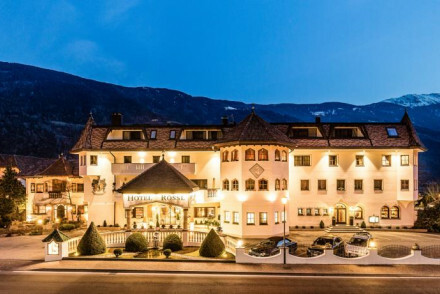 The Parkhotel Holzner is an historic hotel near Renon with impressive views of the surrounding mountains. There are 40 traditional rooms and suites with chintz fabrics and parquet floors, plus a wonderful spa. Child-friendly with lots of activities for young and old. 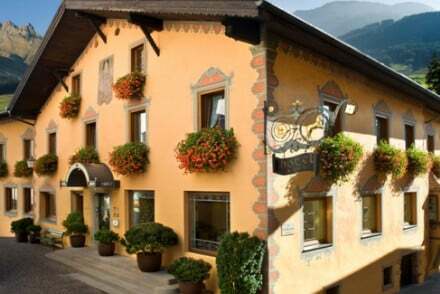 The Hotel Greif is a 33 room hotel with an historic exterior right on Bolzano’s main square. The rooms are large and filled with antiques, there’s a popular bar and the pool, spa and restaurant of its sister hotel are available to guests. The Miramonti is a stunning, hight altitude hotel with wonderfully minimalist rooms and suites which offer incredible views. There’s an excellent spa and a Tyrolean restaurant. 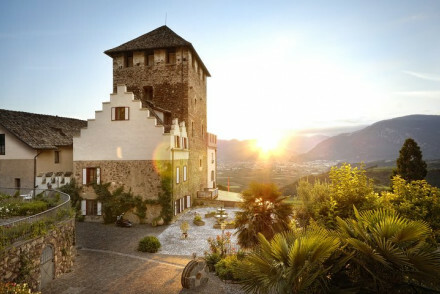 The Schloss hotel Korb is a fabulous castle overlooking its own vineyards and onto lush valleys. There are 44 elegant rooms and suites decorated with romance in mind, some with their own balconies, and an enormous wine cellar. Zur Goldenen Rose is a secluded, romantic hotel in the Senales Valley with 22 contemporary rooms and suites and stunning views. 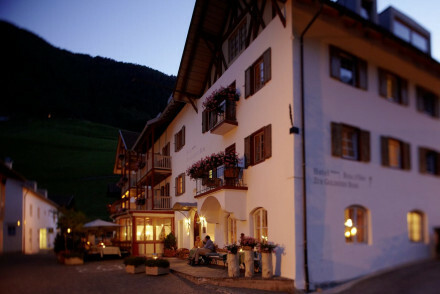 The restaurant serves traditional, alpine cuisine and there’s a luxurious spa. 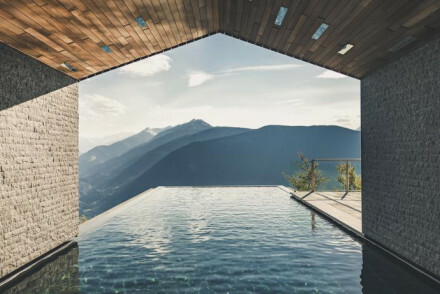 San Luis is a tranquil, alpine retreat in the forests of the South Tyrol with deluxe tree-houses and lodges with a rustic-chic feel and minimalist interiors. There’s some wonderful outdoor activities on offer and plenty of space to run around. Cavallino d'oro is a charming 13 room, boutique-style hotel set amongst the stunning foothills of the Dolomites near Castelrotto. There's a choice of room size, up to family suites, and a free shuttle to the Alpe de Siusi cable car. There is also a spa. 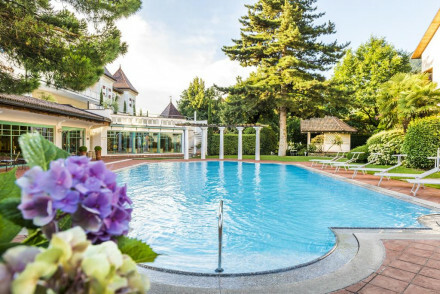 The Hotel Roessl in Rablà, is a charming, family-friendly hotel and wellness centre with a heated outdoor pool and an indoor pool. There’s a gourmet restaurant specialising in Tyrolean cuisine and plenty of activities close by. 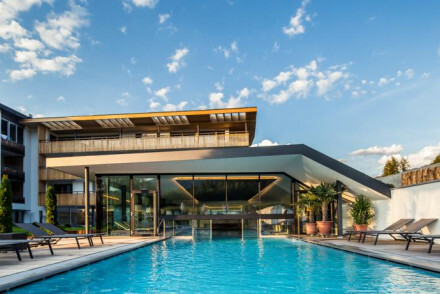 The Engel Spa & Gourmet Resort is a luxurious spa hotel in a picturesque mountain setting with 68 individually styled rooms featuring opulent decor and some nice antiques. There’s a gourmet restaurant with an excellent wine list and, of course, an extensive spa menu using lots of natural products from the Dolomites. The Hotel Mirabell is a top of the range health and fitness chalet with views across the Dolomites, an Ayurvedic restaurant, an extensive spa and access to skiing, golfing and hiking - when in season. 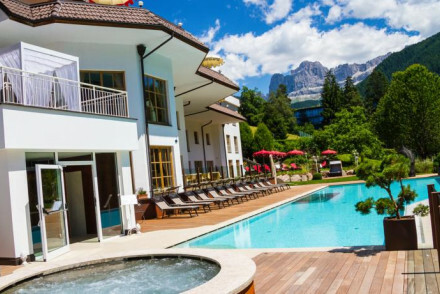 The Hotel Quelle is a luxurious spa chalet in the Dolomites with 65 traditional rooms and suites, extensive spa facilities and a restaurant which can provide all your meals. 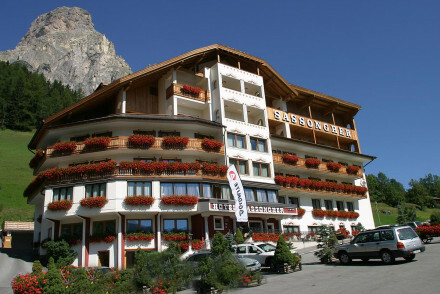 The Hotel Sassongher is a stunning, five-star chalet with large rooms and enormous suites and wonderful views. There’s also a spa and wellness centre and great access to the slopes. Pra Ronch is a charming chalet in the Dolomites with five spruce-lined rooms, complete with open fires and fur rugs, There’s a large garden and you’re close to walking trails and the pistes in season. Rooms start from around £65 per night. 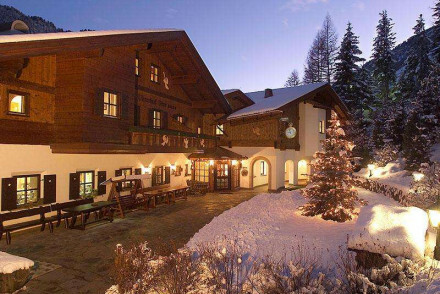 The Hotel Fanes is a lovely little chalet with 12 rooms and an extensive wine cellar. The decor is traditional and family friendly and there’s plenty of mountain activities on offer nearby. 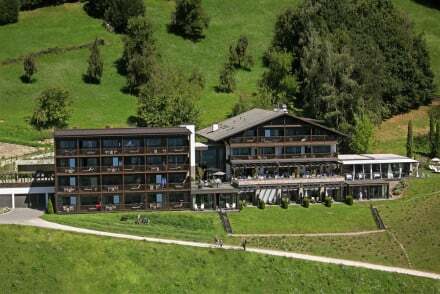 For around £100 per night you can stay in the Hotel Kuglerhof, a stunning, contemporary style mountain hotel with spectacular valley views. There are 35 generously sized rooms and suites and a great spa. This is a great spot for Nordic walking and thermal baths. There is a small airport at Bolzano but the best option for getting to South Tyrol is to fly to a big transport hub like Munich, Milan or Verona. South Tyrol is well connected by train from Verona to the south and Innsbrück to the north. Travelling around the region is made a lot easier by having a car, so visit our online partner Rentalcars. Skiiers will want to head to South Tyrol in the winter but the region also experiences warm summer months and beautiful autumn colours. Browse through our list of all the best places to stay in the South Tyrol Region. Or contact one of our friendly Gurus for personal travel advice. A charming chalet in the Dolomites. Spruce wood rooms with views and rugs. Attic rooms for romance, and fireplaces to relax by. Hearty breakfasts and a large garden. Miles of pistes and walking trails outside the door. A perfect Alpine weekend for couples or families. Friendly hotel overlooking Dolomites. Elegant rooms have carpeted floors, pale wooden furniture and modern bathrooms. Outdoor pool, terrace, gardens, spa and sauna. Lovely restaurant offering traditional South Tyrolean cuisine. Family friendly, pretty and peaceful. This lodge is nestled in dramatic Alpine landscapes and promises utter luxury. The rooms are a seductive combination of traditional interiors, with oak-panelled walls and cow-skin rugs mixed with modern furnishings. Including a restaurant, two swimming pools and a spa. Designed for pure relaxation. A perfect chalet hotel with an extensive wine cellar, swimming pools, delightful food, and family friendly accommodation. Traditional rooms and suites have wooden beamed ceilings, pretty furnishings, balconies and all the mod cons. A charming spot and lots of mountain activities. Active Holiday - Plenty of mountain activities on your doorstep. Views - Sweeping valley views. 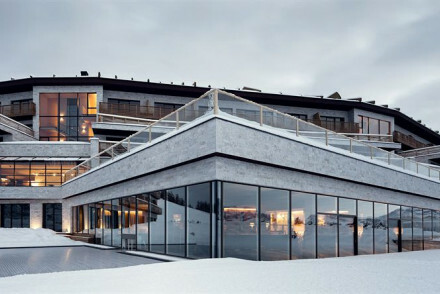 A stunning and contemporary mountain hotel. Big rooms and suites with valley views. Spa, pool, and restaurant using fresh local produce. Wine tasting, Nordic walks and thermal baths in the area. A perfect choice for a honeymoon or couples. Spa - Susanne Kaufmann spa. A top of the range fitness and spa chalet. Large rooms with wooden floors and views across the Dolomites. Health restaurants serve Ayurvedic dishes, extensive spa, fitness programs. Skiing, hiking, and golf. Ideal for fitness enthusiasts and those looking for a healthy break in the mountains. Active Holiday - The hotel is designed to make you exercise! A beautiful hotel in the foothills of the Dolomites. Stunning views, attractive boutique interiors, an excellent spa, and free shuttle to the Alpe de Siusi cable car. A range of accommodation includes single, doubles, triples, and suites. Superb activities all year round. A spectacular art hotel set across four, 13th-century listed towers. Each room has unique design features drawing on the building's history: beautifully tiled headboards mounted in oak frames, exposed wooden beams and free-standing bathtubs. Stunning terraces and views complete this fairytale hotel. 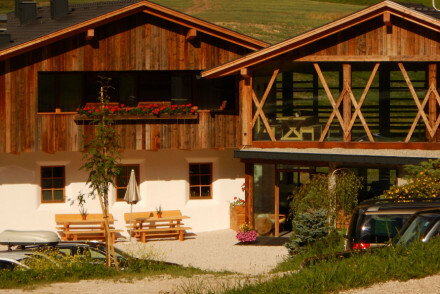 A stunning Five Star chalet in typical South Tyrolean style. Charming rooms and enormous suites have mountain style fabrics, wooden ceilings, and private balconies. The spa is top of the range with an extensive wellness centre, excellent food, and easy access to plenty of mountain activities. Active Holiday - Perfectly positioned for a ski holiday in the Dolomites. Spa breaks - Top of the range wellness centre. A secluded mountain hotel in the Senales Valley. Romantic rooms and suites with soft colours and contemporary finishings. 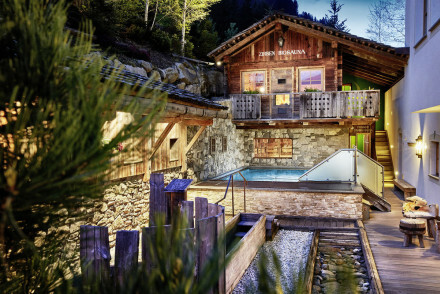 Stunning views, excellent traditional Alpine cuisine and spa. Romantic, peaceful and special. 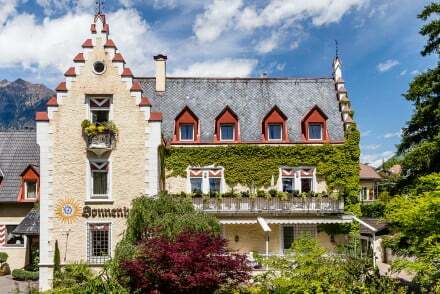 A charming hotel with glorious views of the Geisler mountain range and the Schlern massif. 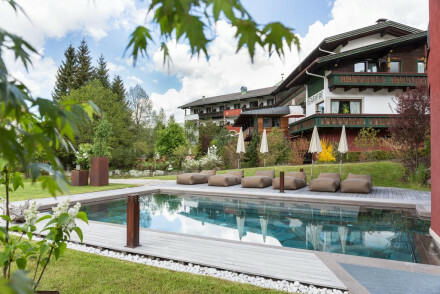 Relax amidst traditional wood interiors, pamper yourself with fabulous Spa treatments and enjoy gourmet Tyrolean and Italian specialities in the well regarded restaurant. Perfect for a winter or summer break. Spa - Hammam, Finnish sauna, hot tub, steam room, Kneipp hydrotherapy treatments and a solarium. Sights nearby - Castelrotto and the Alpes de Suisi. A luxurious and historic property boasting an enviable Alpine location. The forty rooms are filled with old world charm yet encompass modern sensibilities. Large indoor and outdoor pools and an expansive spa aid utter relaxation whilst the surrounding mountains provide plenty of adventure. Total relaxation - The Alpine setting, spoiling spa and fabulous restaurant make for a very relaxing stay. Families - With plenty to entertain both adults and children this is the ideal family escape. Sailing - Take a scenic boat trip across the Pragser Wildsee Lake. My Arbor is a unique hideaway, nestled in nature and offering cutting-edge luxury. 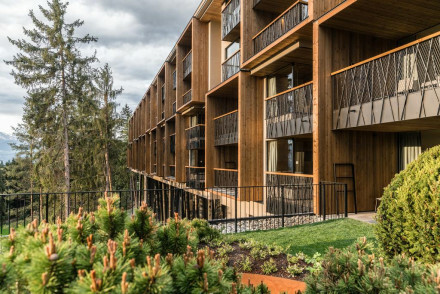 With a range of terraced suites featuring exceptional wooded decor, luxury bathrooms and an inside-outside feel. Offers an extensive spa, two pools and a gourmet restaurant serving local produce. A stylish retreat. Total relaxation - With a comprehensive spa, luxurious suites and a tranquil location, relaxation is top of the list! 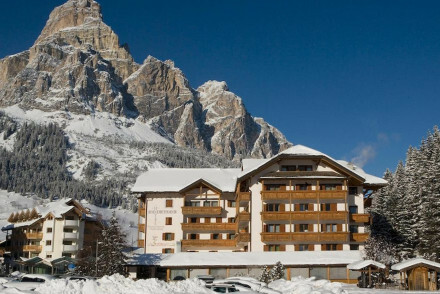 Nothing can beat staying in a really comfortable hotel when skiing and the Col Alto in Corvara is a great choice in the Dolomites. From here you can ski the Sella Ronda, swoosh down The Hidden Valley and have lunch in one of many neighbouring resorts. 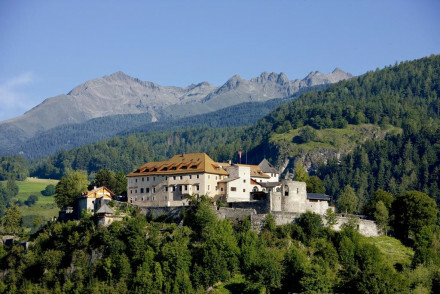 A fabulous castle in a magical setting overlooking luscious valleys and its own vineyard. Elegant rooms and suites decorated with romance have four poster beds and private balconies. Enormous wine cellar, gourmet cuisine, stunning panoramic views, and a top of the range spa. Very luxurious. Romantic Break - Fabulous for a romantic break in beautiful surroundings. Views - Stunning views from all angles over the valley below. Romantic - A fairytale castle in a magical setting. Wine tasting - The hotel has its own vineyard. An historic chalet with a long skiing history. Traditional and cosy throughout the rooms and suites, some with enormous four poster beds and private balconies. Fabulous views from the terrace restaurant, top of the range spa and indoor pool, and ski facilities. Family friendly. Views - Fabulous valley views from the restaurant's terrace. Suites - The top suites have enormous four poster beds. Families - A cosy spot well suited to families. Skiing - The hotel has its own ski room. A wonderful Alpine eco-friendly mountain resort. Nordic rooms and suites are minimal and light with all the mod cons and private balconies. Two fantastic restaurants, extensive spa, and sunny terraces. The perfect spot for exploring the mountain. Active Holiday - The mountain resort offers lots of alpine activities. Eco break - An all natural building made from eco fibres. 5* castle overlooking Dolomites. Large rooms have mahogany furniture, wooden floors and opulent bathrooms. Outdoor pool, spa, sauna, sunny terraces. Superb dining in the Michelin starred restaurant; cosy bar. Luxurious, peaceful and authentic, with excellent service and attention to detail. 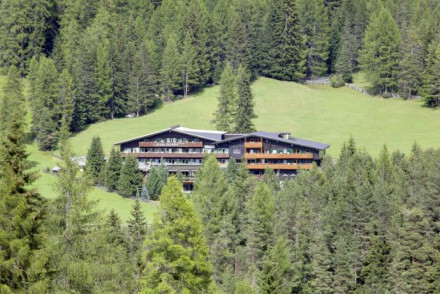 In the heart of the Dolomites the NaturHotel Miraval has a variety of luxury rooms and apartments. All rooms have a terrace or balcony from which to enjoy the views & are finished with stone and pine furnishings. There is also extensive spa facilities & a gourmet restaurant with Italian cuisine. 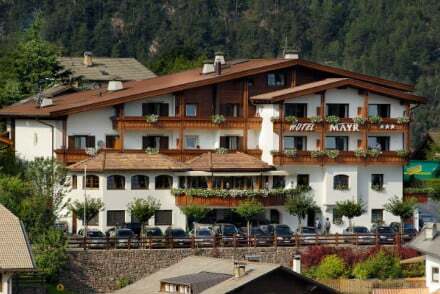 Skiing - Naturhotel Miraval is lcocated close to the lift which will take you right into the Dolomiti Superski area. Great walks - The summer months provide wondeful hiking trails. Breathtaking views of the incredible Dolomites. Rooms have a classic ski chalet feel with plenty of pine and some with four poster beds. There's a relaxing spa to ease weary limbs and gourmet food at La Siriola restaurant. Ideal for an active holiday either in winter or summer. Great walks - Fabulous walking and hiking in the surrounding countryside when the snow has melted. A charming family friendly hotel with heated outdoor and indoor pool, wellness centre and gym. Bedrooms are contemporary alpine style some with statement bath tubs. The gourmet restaurant serves Tyrolean dishes. Activites close by include hiking, golf and mountain biking, plus skiing in winter. Swimming Pool - Heated indoor and outdoor pools plus a natural outdoor bathing pond. A historic hotel boasting epic views of the surrounding mountains. Traditional rooms feature chintz fabrics, parquet flooring and pine furniture. A glorious spa is the perfect place to unwind post a day in the mountains. Very child friendly with plenty of activities for little ones. Splendid. Families - There are numerous activities designated for children and a dining room just for little ones. Active Holiday - The surrounding parkland provides ample opportunity for outdoor enthusiasts. Local markets - In the old town of Bozen visit the unique arcades of the Lauben and during Christmas time you can enjoy the Christmas Market. 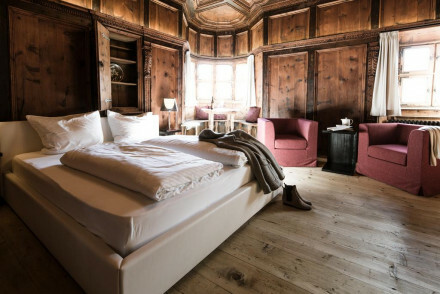 A boutique hotel in the picturesque village of Issing, offering rooms that blend chic decor with a traditional aesthetic. Boasting stunning views of the Pustertal Valley, the best come with balconies. Featuring an award winning restaurant and an indulgent spa. A stylish mountain escape. Active Holiday - The hotel offers everything from horse riding, guided hikes, Nordic Walking tours and skiing. Spa breaks - The spa includes a Finnish sauna, gym and a range of massage treatments. Following an epic renovation, Greif succeeded in retaining its historic exterior and creating a timeless retro interior. Large rooms with views are filled with light and antiques. The Grifoncino bar attracts a crowd whilst a pool, spa and restaurant can be used at its sister hotel Parkhotel Laurin. 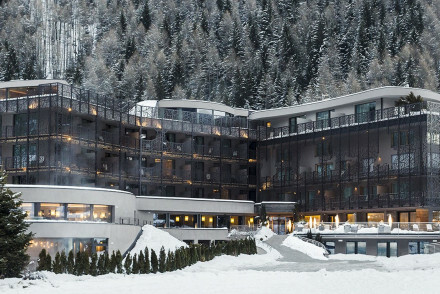 A luxury hotel and spa in a picture perfect mountain setting. Individually styled opulent rooms with heavy antique furniture and fabrics; the best feature free-standing baths. A gourmet restaurant with an excellent wine list, and expansive spa using natural products from the Dolomites. Pure bliss. Spa breaks - The spa boasts treatments using local natural products, physiotherapy and sport therapy experts plus Ayuveda treatments. Romantic Break - An ideal escape for two, with gorgeous suites, couples treatments, massages and romantic walks. A charming chalet with stunning mountain views. Interiors are classic mountain style with lots of wood, tiled floors and cosy rugs. There's a good range of accommodation including family suites for up to four. The restaurant offers a daily changing menu and there's a spa for easing weary limbs. Active Holiday - The mountains provide the perfect terrain for all manner of outdoor pursuits from skiing to hiking. Spa breaks - A glorious spa using natural products with ingredients coming from the surrounding mountains. Skiing - Sixty kilometres of pistes starting right from the hotel door. 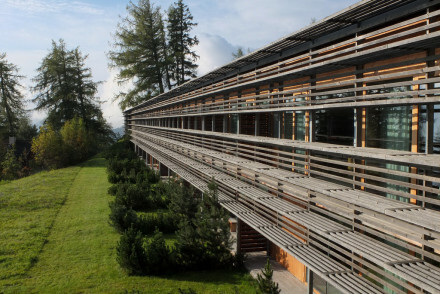 A stunning high altitude hotel with incredible views of South Tyrol. An immersive staying experience, the glass fronted rooms are modern and minimalist, boasting phenomenal valley views. Luxuriate in the state-of-the-art spa and enjoy Tyrollean delicacies in the restaurant. An oasis of tranquility. Romantic Break - A romantic getaway with chic suites offering spectacular views over Merano, and regional organic cuisine served on the terrace. Total relaxation - A beautiful wellness area with indoor pools, saunas, steam baths in natural stone, outdoor hot tub and massage rooms. Great walks - Great walking trails in the surrouding South Tirol countryside. Sights nearby - Visit the nearby Gardens of Trauttmansdorff Castle. 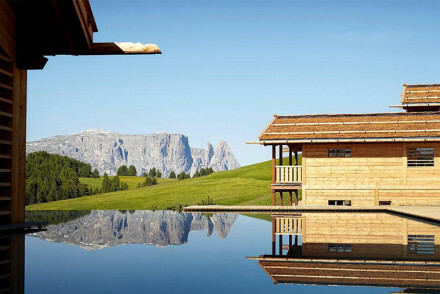 A modern Five Star lodge in a valley of the Dolomites. Large interiors with lots of natural light built from sustainable wood. Light contemporary rooms are simple in style with all the mod cons and balconies. Top of the range spa and restaurant serving seasonal produce. Skiing - Seis-Seiser Alm Gondola, Bullaccia Gondola, and Al Sole Ski Lift. Views - Fantastic views over the Dolomites. Spa breaks - Top of the range spa and pools. Eco - Built of sustainable wood. 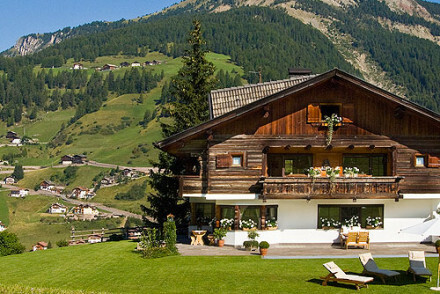 A really beautiful chalet in a stunning valley setting. Cosy, but highly luxurious interiors combine modern comfort with traditional elegance. Enormous rooms and suites, fabulous Ayurvedic spa, Michelin starred restaurant, and skiing on your doorstep. A classical spot for a pampering holiday. Outstanding location - UNESCO World Natural Heritage area in the heart of Italy's Dolomites. Skiing - Ski right out of the door onto the slopes. Wine tasting - Fantastic Mahatma Wine cellar. Ancient farmstead turned hotel in the South Tyrol with stunning mountain views. Alpine chic rooms feature exposed beams and vaulted ceilings plus private balconies to soak up the views. Restaurant serves South Tyrolean cuisine with many ingredients grown on site. A peaceful alpine retreat. 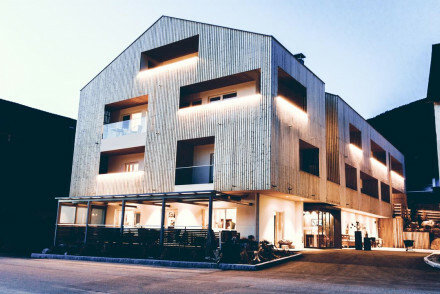 Holistically designed hotel featuring an indulgent spa and unique slow food restaurant, with a focus on both mindfulness and Alpine adventure. Minimal, modernist interiors use materials such as concrete and Alpine wood and are imbued with a chic cosiness, while the spacious rooms have great views. A chic luxury property with an enviable location in the Dolomites. Boasting facilities for all seasons, from a stunning infinity pool to a warming sauna. Large windows in the rooms make the most of the stunning views. An award winning restaurant serves exemplary regional cuisine. Fabulous. Active Holiday - From skiing in the winter to horse riding in the summer there's a multitude of activities to partake in. A chalet-style hotel within a dramatic valley, offering stunning views. The spacious rooms are homely and feature wooden decor traditional to the region. With pools, an extensive wellness centre and a traditional restaurant. Incredible scenery and traditional comfort combine for a charming stay. Landmark - Comes with a reputation. 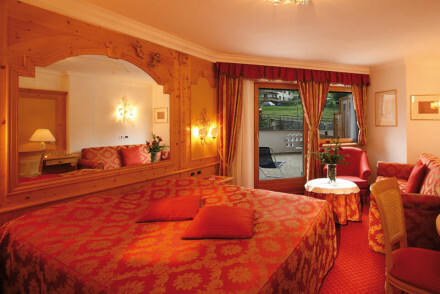 A Five Star hotel in a breathtaking location with panoramic views of the Dolomite's valleys. Eco-friendly design is superbly minimal and fitting with the nature of its location. Top of the range spa and pools, ski in and ski out facilities, local produce in the restaurant, stunning rooms and suites. Views - Stunning views from all angles of the hotel, and from the indoor spa area out over valleys beyond. Active Holiday - The hotel provides ski storage, ski equipment rentals, and ski passes. Hills & mountains - Set on the Alpe di Siusi. A luxurious spa chalet in the Dolomite mountains. Rooms and suites are traditional and clean with wooden panelling, balconies and all the mod-cons. Extensive spa facilities and restaurant provides all meals. Skiing, hiking, and wine tasting available. A great choice for couples or groups. Romantic Break - There's even a Romeo & Juliet private spa suite. Spa breaks - Top of the range spa for total pampering. A tranquil alpine retreat tucked away in the forests of South Tyrol. The deluxe treehouses and lodges exude a rustic-chic feel with minimalist furnishings set in pine interiors. With a host of outdoor pursuits on tap, it's perfect for an escape into the alpine wilderness. A hidden gem. 3 night min. Back to Nature - Nestled amidst the forest, this tranquil rural hotel is made up of a series of secluded alpine lodges and treehouses. Families - Perfect for families with self-catered lodges and plenty of space for the little ones to run around. A chic designer hotel in Caldaro, with great views of the surrounding vineyards. Rooms are spacious with warm colour tones, high quality upscale furniture and private balconies or terraces. A late breakfast is available in the cafe and the in-house Vineria serves exclusive top quality wines. Foodies - The South Tyrolean Wine Road is well known for its upscale restaurants with Italian and Tylorean cuisine and special wines. Families - A kitchenette in the rooms so you may help youself at any time of the day, good for people travelling with young children. Honeymoons - A beautiful destination and a designer hotel offering private jacuzzis, breathtaking views and pampering service. Total relaxation - All rooms either come with a private hot tub, a private outdoor swimming pool or a private finnish sauna. Perched on a hill in a fairytale setting, this delightful hotel dates back to the 15th century. Cosy rooms and interiors feature Tyrolean pine and walnut. The food is ambrosial; the wine list renowned. Gaze at snowy peaks, stroll or cycle through flowery meadows, and bliss-out in the luxurious spa.